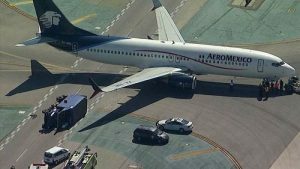 Home » » NEWBORN BABY FOUND DEAD ON PLANE. NEWBORN BABY FOUND DEAD ON PLANE. The Indonesian police Sunday detained the suspected mother of a new-born baby who was found dead in a aircraft toilet at Jakarta’s international Airport. “She didn’t look healthy and won’t be questioned until she is fit. The woman is now at the airport’s health centre,” Yusef told AFP. “The woman was in economy class but then laid on a business-class seat with an oxygen mask. The captain then announced we should divert to Bangkok,” passenger Francesco Calore told AFP. A medical team boarded the plane to evacuate Hani after the Airbus A330 landed at Bangkok’s Suvarnabhumi International Airport, he added. Ground cleaners in Jakarta found the full-term dead baby wrapped in a plastic bag in a drawer in one of the plane’s toilets, Yusef said, adding the cause of death had yet to be determined.